The WSS 1060 Scanning System from Symbol Technologies helps users achieve new levels of productivity and accuracy while advanced ergonomics make them easy to use and comfortable to wear. Scanning portable computing and wireless networking can now be performed while the user's hands remain totally free. Plus the WSS 1060 system represents breakthroughs in miniaturization performance and data transmission. These new capabilities can increase productivity and ease of use in warehousing transportation-logistics manufacturing retailing and other industries including e-commerce. The WSS 1060 system comprises two components - a scanner and wearable wrist computer. The RS 1 Ring Scanner is worn on the index finger. It is activated by pointing the finger at the barcode while pressing the thumb against a trigger. The RS 1 Ring Scanner is the smallest wearable laser scanner in the world weighing only 1.7 oz.-48 gm and just 0.9 in.-23 mm high. It is ideal for scanning barcodes at distances of up to 2 ft.-0.6m. 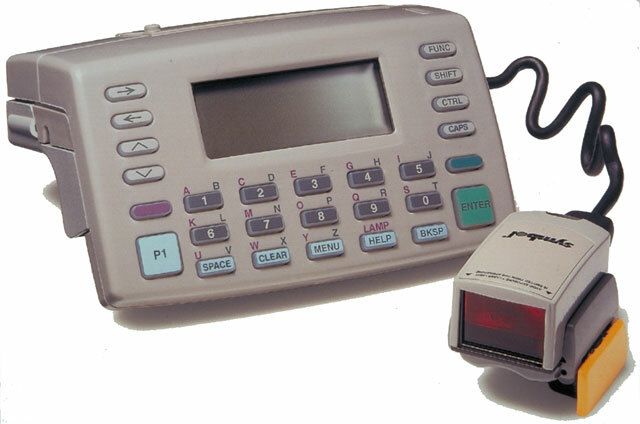 The WS 1000-LR long-range scanner is worn on the back of the hand and reads barcodes on pallets at distances of up to 25 ft.-7.6 m. The WWC 1060 computer is worn on the forearm and include a CPU display keyboard battery pack and Spectrum24 wireless communications. The WWC 1060 features Spectrum24 High Rate with 11 Mbps throughput. Designed to IEEE 802.11b interoperability standards for next-generation direct sequence wireless LANs Spectrum24 High Rate delivers data transmissions of up to 11 Mbps that's more than five times faster than standard wireless LANs. But Symbol didn't stop at defined standards: super-smart algorithms advanced mobility and security features and much more combine to bring you the best in high-speed wireless LAN technology and services.